The Board of Directors formed the Continuing Education Committee to explicitly offer SIA members opportunities to learn about various aspects of Industrial Archaeology and Heritage. In the past these opportunities included short-courses on subjects such as identifying and recording historic bridges, GIS for IA, and digitally recording historic structures. The Committee strives to make these opportunities relevant to the SIA mission, interesting to the members, and cost effective (at a minimum break even on education costs vs. expenditures). 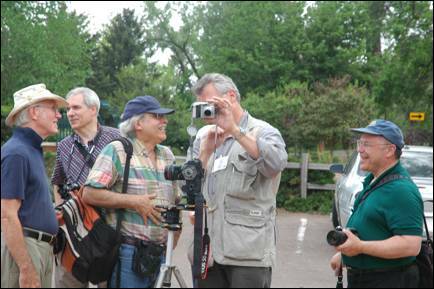 At the 2010 Annual Conference in Colorado Springs, Co, the Education Committee organized a Photography Workshop. The half-day workshop featured James C. Owens (Senior Fellow at Torrey Pines Research and the Past President and Fellow for the Society for Imaging Science and Technology), Jet Lowe (long-time HAER staff photographer), and Richard K. Anderson, Jr. (Cultural Resource Documentation Services). Jim Owens began the presentation with a history of photography and how technologies have changed. He then discussed digital imaging, image capture (the camera), image editing (both in-camera and post-camera), archiving, and laser mapping. During his talk, Dr. Owens and offered practical, understandable description of how cameras and digital technologies work and made suggestions as to how to format and store and photographs. Jet Lowe offered participants seven photography “Commandments” (or helpful hints). These included “Know Thy Camera as Thyself”, “Slower is Faster” and “Follow the Light.” Jet discussed how our job, as industrial archaeologists and preservationists, often entails convincing people that the “Industrial and Cultural Heritage of the built environment” is important. His portion of the workshop addressed this conundrum by teaching participants how to frame and present photographs that “allow images of structures [to] be more persuasive and convincing” (Jet Lowe’s presentation notes). Richard K. Anderson, Jr. focused on how properly taken and processed photographs can yield dimensional information. He observed that “[i]n addition to photography and written data, measured drawings are a primary means for documenting engineering and industrial heritage.” He discussed the types of dimensional information contained in photographs, rectifying photos to obtain accurate dimensional information, as well as perspective and distortion. Richard also offered simple, cost-effective techniques that photographers could use to reduce or correct distortions and glean dimensional data for use in accurate technical drawings. Following the presentations and a question and discussion period, the presenters and participants dispersed for lunch, re-conveying for a walking field trip to use some of their newly acquired skills and information. 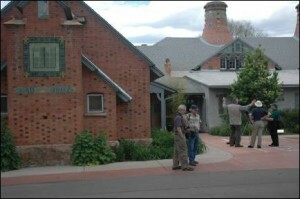 The field trip took participants to the Van Briggle Pottery, approximately one mile from the conference hotel. The 100-year-old pottery structure operated between 1908 and 1968, producing thousands of ceramic art and architectural pieces. 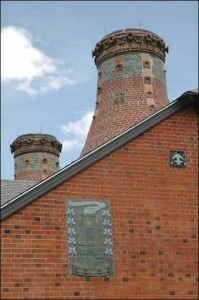 Dutch architect Nicolaas van den Arend designed the striking red brick Van Briggle Pottery Company building. The exterior is adorned with thousands of Van Briggle tiles and terra cotta ornaments, the most famous of which is the Van Briggle cat. Thanks to the presenters and participants, the Photography Workshop was a great success! 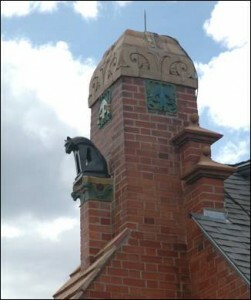 The Continuing Education Committee is currently exploring continuing education ideas and opportunities for the upcoming year, including offering continuing education credits for workshops, offering longer, full-day or multi-day short-courses, and compiling a list of school programs focusing on industrial archaeology, heritage or preservation. If you have ideas for future workshops or would be interested in teaching continuing education courses, have suggestions for the continuing education newsletter column, or other questions or comments regarding the Continuing Education Committee’s activities, please contact Amanda Gronhovd. Finally, please consider becoming a member of the Continuing Education Committee! No matter if you have a little time or a lot of time to donate to the committee, we welcome it all and will find a place where you can be an active and contributing member of the SIA – a place that fits with your schedule, interests and expertise!